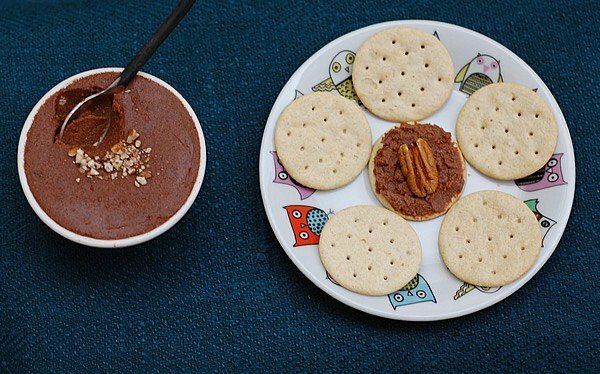 Pecans, Chocolate, and Dates – oh my! This is my new favorite spread and it’s good on just about anything. I enjoyed turtle butter on crackers, graham crackers and between 2 slices of whole wheat bread and grilled. Tell me how you are using it – I’m dying to know! I always have pecans in my pantry because Cheryl gets a few pounds from her work at the holidays. If I’m really lucky a co-worker or two will donate their pecans to use too. 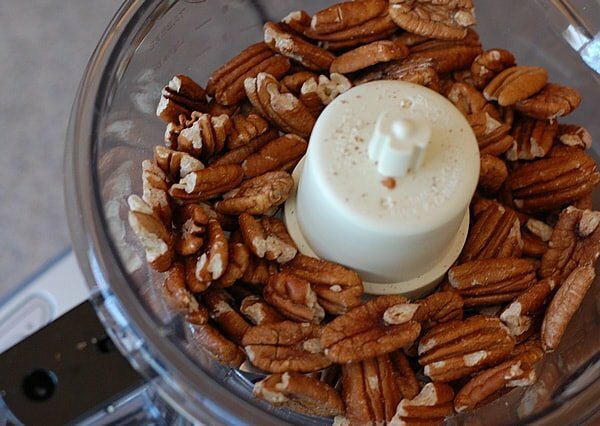 Depending on where you live, pecans can be expensive. When I was in my 20’s and lived in New York I went searching for some to make a chocolate bourbon pecan pie for a dinner party I was going to. I was shocked by the price of pecans and realized I wasn’t in North Carolina anymore. It was an ah-ha moment for me. You can make this with just about any nut you have in your pantry. You might have to add a little more liquid, however it should be almost the same amount of all of the other ingredients. I think this goes well with anything you think Nutella (or a vegan sub) would be welcome. 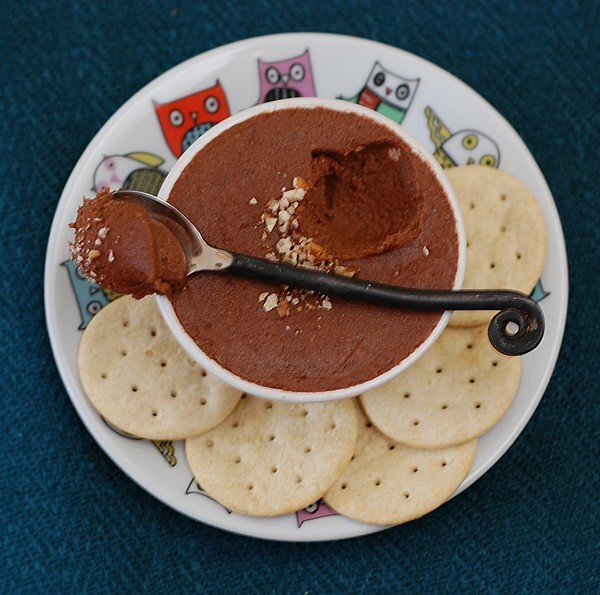 I used it in The Kitchn’s Oatmeal Nutella Mug recipe in place of the non-vegan Nutella, and I loved it. 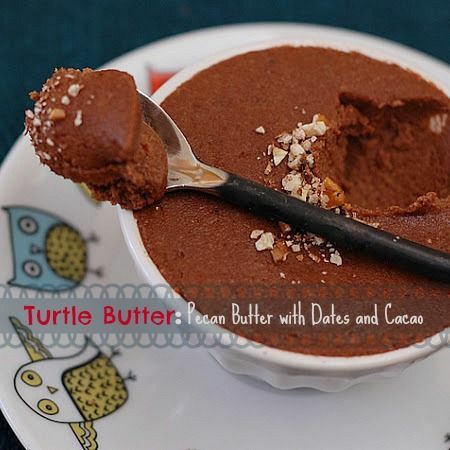 Let me know what recipes you use your turtle butter in by commenting below. I can’t wait to hear! The only time-consuming step is to cook the dates to soften them up. Really, that’s not much time at all. I used cacao powder because I have some in my pantry, but plain old cocoa powder would taste just as terrific. You can also add more maple syrup or dates if you’d like yours sweeter. Put the dates and water into a small saucepan and bring to a boil. Turn off heat and let sit for 15 minutes. This softens the dates and makes it easier to puree them. Add the pecans, cacao powder, maple syrup and salt. Add in the dates and 2 tablespoons of the cooking liquid. Puree, scrape the bowl down and process until very smooth adding more cooking liquid if needed. Make sure to taste it so you can add more maple syrup or cacao powder to make it just the way you like it. Store in the fridge and serve on crackers in paninis and any other way that makes you happy! I’ll definitely make this! It sounds delicious! In love with this and pinned it under GF eats. this sounds like perfection! 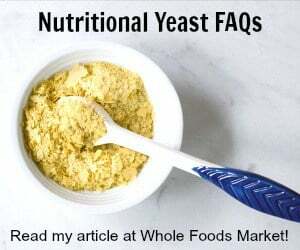 Adding to my round up of nut butters!